The dinosaurs have been let loose and have arrived at Cardiff’s, Bute Park. The beautiful grounds of one of Cardiff’s most loved parks has been turned into a prehistoric world this summer, where over 30 interactive, life sized replicas rome the grounds. Brave explorers come face to face with a 26m long Diplodocus and the notorious Tyrannosaurus Rex, all of which come to life before your eyes, with their tails, eyes, heads and arms moving and making you jump with their raging roars. In the education marque one can watch a 30-minute viewing experience produced by the BBC, which plays on a large projection screen and documents the dinosaurs time wandering the earth right up until the ice age. One aspects of this attraction aside from the dinosaurs themselves which are fantastic, is the excavation, which will keep mini-dinosaur palaeontologists entertained for hours as they dig for bones. There are a herd of street food and drink vendors for when the gang gets peckish or thirsty. A retail marquee sells a range of educational and entertaining branded merchandise so dinosaur-lovers can remember their experience. 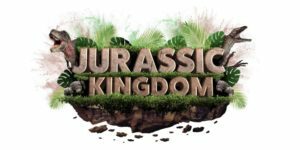 This is the first outdoor dinosaur experience of its kind in the UK and a truly entertaining and educational experience for children of all ages. The event is open daily from 10am to 6pm with last entry at 5pm. When selecting tickets you will be asked to select a time slot and entry is at hourly time slots from 10am to 5pm. Once inside the event visitors can stay as long they wish but it will close at 6pm.